The Great Pacific Garbage Patch (GPGP) is a 79,000 ton mass of debris floating in the North Pacific Ocean. An international team of scientists affiliated with The Ocean Cleanup Foundation conducted a three-year study on the GPGP. Their results, which were published in the journal Scientific Reports on March 22, 2018, suggest that the amount of plastic pollution within the GPGP is increasing at an “exponential” rate compared to that of surrounding waters. Concentrations of debris like the GPGP form in gyres, which are “a system of circular ocean currents formed by the Earth’s wind patterns and the forces created by the rotation of the planet,” according to National Geographic. With a calm and stable center, the circular currents draw in and trap marine debris. The debris accumulates because most of it is not biodegradable. Instead, debris such as plastic fragments into smaller pieces. Fifty of the plastic products found in the study had readable production dates, one of which dated back to 1977. The study also found the GPGP to be 16 times larger than previously estimated, measuring at 1.6 million square kilometers. That is twice the size of Texas and three times that of continental France. In addition, the researchers stipulated that it is a conservative estimate since only debris that was clearly identifiable was logged into their analyses. They wrote that the larger size measured may be due to use of more “robust methods” in quantifying the bigger macroplastics, such as crates, cones, and megaplastics, such as fishing nets, over larger surface areas. Even though microplastics, which include items such as fragments of plastic products and ropes, made up 94 percent of the estimated 1.8 trillion pieces in the patch, they only accounted for 8 percent of the total mass. Previous studies had primarily relied on surface trawl samples of the debris, which are limited by the small area coverage of the trawls. To compensate, other studies had included vessel-based visual surveys. The researchers also noted that the plastic input from the 2011 Tohoku tsunami in Japan, which reportedly swept 4.5 million metric tons of debris into the ocean, could also contribute to the size difference. Three hundred and eight-six of the pieces of the debris sampled had words on them, totaling nine languages, a third of which were in Japanese and another third in Chinese. 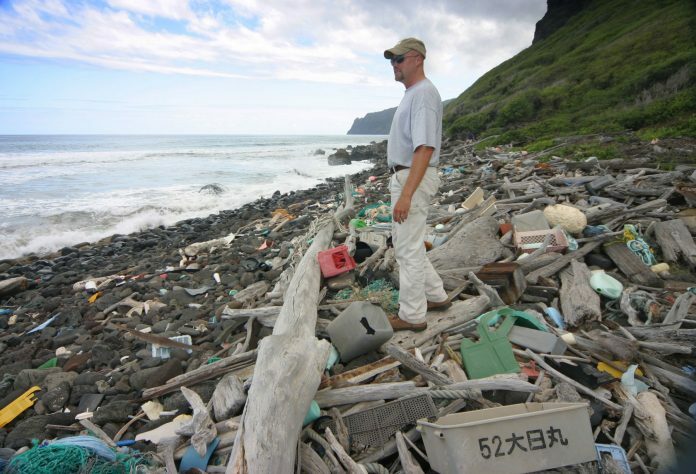 Marine debris, whether it be micro or macro, has been shown to be very harmful to marine life. Loggerhead sea turtles often ingest plastic bags, mistaking them for jellyfish. Abandoned fishing nets drown marine mammals in their clutches, a phenomenon known as ghost fishing. However, as adverse are the consequences of ocean plastic pollution, cleaning up the GPGP is a difficult task to tackle. The effort would “bankrupt any country that tried” according to Charles Moore, who discovered the GPGP. On the bright side, many individuals and international organizations are stepping up to the plate, and ongoing research continues to offer new insights. In addition to providing a more accurate size estimation of the GPGP, the study also found a way to predict the GPGP’s location at monthly intervals. More sampling and systematic monitoring are needed, according to the authors, as much remains unknown about the level of plastic pollution below the ocean surface. Thank you. Please write more on this subject when there is news.